Library will be closed at 5pm. Students may borrow reserve books as early as morning to be returned on January 5, 2009. Library will be closed at 4pm to give way to the U.P. College of Engineering Library II Christmas Party. Last day for borrowing of books. Concepts in Computing provides a clear, concise introduction to the fundamentals of computer science. The author generates excitement, curiosity, and enthusiasm in students and leaves them with a desire to learn more about the fascinating world of computing. The text identifies the important relationship between computing and the disciplines of engineering and mathematics. It focuses on the three important areas of Software/Programming/Design, Computer Systems/Architecture, and Theoretical Foundations. It is clear that students learn faster, and retain and integrate knowledge more efficiently, if they see how each subject area connects with, and is interdependent upon others. Concepts in Computing sets a solid foundation for introductory students and is a useful companion to those entering introductory programming courses. C++ plus data structures, 4th ed. Updated and reorganized, C Plus Plus, Plus Data Structures, Fourth Edition explores the specifications, applications, and implementations of abstract data types with unmatched accessibility. Written by renowned author and educator Nell Dale, this text provides intuitive explanations that clarify abstract concepts, and approaches the study of data structures with emphasis on computer science theory and software engineering principles. Topics such as modularization, data encapsulation, information hiding, object-oriented decomposition, algorithm analysis, life-cycle software verification models, and data abstraction are carefully presented to foster good software engineering techniques in students from the beginning of their careers. In addition to the meaningful exercises and case studies that define Nell Dale s teaching philosophy, this fourth edition provides an increased emphasis on object-oriented design and an early introduction of object-oriented concepts. Programming and problem solving with Java, 2nd ed. Extensively revised, the new Second Edition of Programming and Problem Solving with Java continues to be the most student-friendly text available. The authors carefully broke the text into smaller, more manageable pieces by reorganizing chapters, allowing student to focus more sharply on the important information at hand. Using Dale and Weems highly effective progressive objects approach, students begin with very simple yet useful class design in parallel with the introduction of Java s basic data types, arithmetic operations, control structures, and file I/O. Students see first hand how the library of objects steadily grows larger, enabling ever more sophisticated applications to be developed through reuse. Later chapters focus on inheritance and polymorphism, using the firm foundation that has been established by steadily developing numerous classes in the early part of the text. A new chapter on Data Structures and Collections has been added making the text ideal for a one or two-semester course. With its numerous new case studies, end-of-chapter material, and clear descriptive examples, the Second Edition is an exceptional text for discovering Java as a first programming language! Principles of Modern Operating Systems presents a practical introduction to operating systems and illustrates these principles through a hands-on approach using accompanying simulation models developed in Java and C++. The text is primarily appropriate for undergraduate courses in computer science at the junior/senior level. Case studies throughout the text feature the implementation of Java and C++ simulation models, giving students a thorough look at both the theoretical and the practical concepts. This pedagogical approach is designed to present a clearer, more understandable, more practical look at OS concepts, techniques, and methods without sacrificing the theoretical rigor that is necessary at this level. Integration is one of the most critical technical challenges in software today, as well as a difficult topic to generalize because of the many things affecting it the technologies involved, the timeframe, the number and types of user communities requiring access, regulatory requirements, and so on. Fundamentals of Software Integration provides an overview of the evolution of software technology, with a particular emphasis on long-standing problems that remain unsolved. It then uses this background as a basis for presenting an abstract model of the software application and its environment, along with a methodology for how to use this model to develop an integration strategy that meets both short and long-term needs of the organization. Hammer and Timmerman’s accessible writing style and strategic exercises help students recognize similarities in the integration challenges faced across technologies. This textbook presents an introduction to the fundamental concepts of continuous-time (CT) and discrete-time (DT) signals and systems, treating them separately in a pedagogical and self-contained manner. Emphasis is on the basic signal processing principles, with underlying concepts illustrated using practical examples from signal processing, multimedia communications, and bioinformatics. Following introductory chapters, the text is separated into two parts. Part I covers the theories, techniques, and applications of CT signals and systems and Part II discusses these topics for DT, so that the two can be taught independently or together. Accompanying the book is a CD-ROM containing MATLAB code, audio clips, images, interactive programs, and signal animations. With over 300 illustrations, 285 worked examples and 385 homework problems, this textbook is an ideal introduction to the subject for undergraduates in electrical and computer engineering. Engineering fundamentals : an introduction to engineering, [3rd], International student ed. Many countries around the world block or filter Internet content, denying access to information—often about politics, but also relating to sexuality, culture, or religion—that they deem too sensitive for ordinary citizens. Access Denied documents and analyzes Internet filtering practices in over three dozen countries, offering the first rigorously conducted study of this accelerating trend. Students entering engineering programs should gain competency in several areas during the freshman year. Aside from answering the question of whether they really want to study engineering, students must, if they are to be successful, gain an understanding of basic scientific principles, use of computer tools, approaches to engineering problems, and basic study skills. If students do not develop a solid foundation in these critical skills early in their academic career, they will struggle in upper level courses or turn their back on engineering. Saeed Moaveni’s new book is designed to give students an overview of these skills at the freshman level. Often, students do not grasp the importance of developing good study skills and, consequently, will struggle in later courses as a result. This book introduces students to basic study skills while also introducing the engineering discipline in the early chapters. Having thoroughly prepared students, the author then introduces basic principles, physical laws, engineering materials, computer tools, and engineering standards and codes at a basic level so students comprehend the importance of these topics. The book features examples from everyday situations, providing students with a meaningful context in which to learn hard-to-grasp topics. Examples of how the skills being learned are applied to different fields of engineering are supported by the opportunity to apply these skills in hands-on exercises. Throughout the text, Moaveni emphasizes strategies for solving engineering problems as well as the importance of communication skills in terms of writing technical reports or memos, and giving oral presentations. Moaveni’s writing style isstudent-friendly and his “Observe the World Around You” feature is an excellent and unique way to introduce new ideas to beginning engineering students. Image processing, analysis, and machine vision, 3rd ed. This robust text provides deep and wide coverage of the full range of topics encountered in the field of image processing and machine vision. As a result, it can serve undergraduates, graduates, researchers, and professionals looking for a readable reference. The book’s encyclopedic coverage of topics is wide, and it can be used in more than one course (both image processing and machine vision classes). In addition, while advanced mathematics is not needed to understand basic concepts (making this a good choice for undergraduates), rigorous mathematical coverage is included for more advanced readers. It is also distinguished by its easy-to-understand algorithm descriptions of difficult concepts, and a wealth of carefully selected problems and examples. Rizzoni’s “Fundamentals of Electrical Engineering” provides a solid overview of the electrical engineering discipline that is especially geared toward the many non-electrical engineering students who take this course. The book was developed to fit the growing trend of the Intro to EE course morphing into a briefer, less comprehensive course. The hallmark feature of this text is its liberal use of practical applications to illustrate important principles. The applications come from every field of engineering and feature exciting technologies. The appeal to non-engineering students are the special features such as Focus on Measurement sections, Focus on Methodology sections, and Make the Connections sidebars. The PSpice Manual will be sold as a stand-alone and, also, in packages with Neamen, Electronic Circuit Analysis and Jaeger, Microelectronic Circuit Design. Text introduces readers to the fundamental uses of Pspice in support of Microelectronic circuit analysis. This book goes beyond basic circuit analysis to include analysis of more complex electronic problems. Analysis of diodes, BJTs, JFETs, MOSFETs, and transformers will be included – which are all key areas in the Electronics course. Key features include: step-by-step instructions to support novice users as they perform schematic capture and circuit simulation; detailed explanations and examples of the use of PSpice in typical problem-solving situations; and, explains some of the salient features of PSpice, including information on OrCAD Capture and Probe. Author R.C.T. Lee, Mao-Ching Chiu, Jung-Shan Lin. “The writing of this book was motivated by the authors’ observation that convergence is requiring computer science students to gain a better understanding of communications concepts. The authors have therefore written a book that addresses this gap, delivering to the computer science student the key essentials in a thorough manner. The book walks the reader through the Fourier transform, analog and digital modulation techniques, multiple access communications, spread-spectrum communications, and source coding and channel coding. The book has already been used in the classroom and was met with great success in universities as an introductory text in electrical engineering programs. This book provides a concise and clear introduction to signals and systems theory, with emphasis on fundamental analytical and computational techniques. Introduction to Signals and Systems develops continuous-time and discrete-time concepts/methods in separate chapters – highlighting the similarities and differences – and features introductory treatments of the applications of these basic methods in such areas as filtering, communication, sampling, discrete-time processing of continuous-time signals, and feedback. This text is written for introductory courses in continuous-time and/or discrete-time signals and systems for Electrical Engineering students. It is also accessible to a broad range of engineering and science students, as well as valuable to practicing engineers seeking an insightful review. Electric power distribution system engineering, 2nd ed. With numerous examples and problems in each chapter, this second edition of a bestseller explores topics such as distribution system planning and load characteristics. The book provides comprehensive coverage of applications of distribution transformers and capacitors, harmonics on distribution systems, distribution system protection, voltage regulation, reliability, electric power quality, design of subtransmission lines, distribution substations, primary and secondary systems, voltage drop, and power loss characteristics. The author takes special care to familiarize students with industry terms and symbols, providing a glossary and clearly defining each term when it is introduced. Symbian OS communications programming, 2nd ed. Author Iain Campbell with Dale Self … [et al.]. An up-to-date insight into Communications programming at Symbian, incorporating changes introduced by the latest version of Symbian OS (Symbian OS V9), which is the basis of the new phones currently reaching the market. It guides developers through the Symbian OS communications architecture and provides essential information on the communications models and programming interfaces used by Symbian OS. Power system analysis and design, 4th, Int’l student ed. Author J. Duncan Glover, Mulukutla S. Sarma, Thomas J. Overbye. Place of Publication Australia Toronto, Ont. 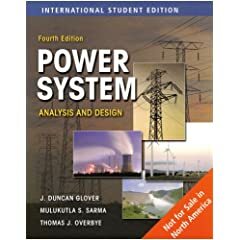 The new edition of “Power Systems Analysis and Design” text provides students with an introduction to the basic concepts of power systems along with tools to aid them in applying these skills to real world situations. Physical concepts are highlighted while also giving necessary attention to mathematical techniques. Both theory and modeling are developed from simple beginnings so that they can be readily extended to new and complex situations. The authors incorporate new tools and material to aid students with design issues and reflect recent trends in the field. Place of Publication Toronto, Ont. “Manage a flexible, highly available Oracle database with help from the expert information contained in this exclusive Oracle Press guide. Fully revised to cover every new feature and utility, Oracle Database 11g DBA Handbook shows how to perform a new installation, upgrade from previous versions, configure hardware and software for maximum efficiency, and employ bulletproof security. You will learn to automate the backup and recovery process, provide transparent failover capability, audit and tune performance, and distribute your enterprise databases with Oracle Net. Covers text mining and link detection algorithms, pre-processing techniques, knowledge representation, visualization and applications. Essentials of programming languages, 3rd ed. Author Daniel P. Friedman, Mitchell Wand. This book provides students with a deep, working understanding of the essential concepts of programming languages. Most of these essentials relate to the semantics, or meaning, of program elements, and the text uses interpreters (short programs that directly analyze an abstract representation of the program text) to express the semantics of many essential language elements in a way that is both clear and executable. The approach is both analytical and hands-on. The book provides views of programming languages using widely varying levels of abstraction, maintaining a clear connection between the high-level and low-level views. Exercises are a vital part of the text and are scattered throughout; the text explains the key concepts, and the exercises explore alternative designs and other issues. The complete Scheme code for all the interpreters and analyzers in the book can be found online through The MIT Press Web site. For this new edition, each chapter has been revised and many new exercises have been added. Significant additions have been made to the text, including completely new chapters on modules and continuation-passing style. Essentials of Programming Languages can be used for both graduate and undergraduate courses, and for continuing education courses for programmers. Author edited by Joseph Feller … [et al.]. The book analyzes a number of key topics: the motivation behind F/OSS—why highly skilled software developers devote large amounts of time to the creation of “free” products and services; the objective, empirically grounded evaluation of software—necessary to counter what one chapter author calls the “steamroller” of F/OSS hype; the software engineering processes and tools used in specific projects, including Apache, GNOME, and Mozilla; the economic and business models that reflect the changing relationships between users and firms, technical communities and firms, and between competitors; and legal, cultural, and social issues, including one contribution that suggests parallels between “open code” and “open society” and another that points to the need for understanding the movement’s social causes and consequences. Author edited by Ronald Deibert … [et al.]. Internet filtering takes place in at least forty states worldwide including many countries in Asia and the Middle East and North Africa. Related Internet content control mechanisms are also in place in Canada, the United States and a cluster of countries in Europe. Drawing on a just-completed survey of global Internet filtering undertaken by the OpenNet Initiative (a collaboration of the Berkman Center for Internet and Society at Harvard Law School, the Citizen Lab at the University of Toronto, the Oxford Internet Institute at Oxford University, and the University of Cambridge) and relying on work by regional experts and an extensive network of researchers, Access Denied examines the political, legal, social, and cultural contexts of Internet filtering in these states from a variety of perspectives. Chapters discuss the mechanisms and politics of Internet filtering, the strengths and limitations of the technology that powers it, the relevance of international law, ethical considerations for corporations that supply states with the tools for blocking and filtering, and the implications of Internet filtering for activist communities that increasingly rely on Internet technologies for communicating their missions. Reports on Internet content regulation in forty different countries follow, with each country profile outlining the types of content blocked by category and documenting key findings. Gray hat hacking : the ethical hacker’s handbook, 2nd ed. Author Shon Harris … [et al.]. Written by seasoned security authors and instructors, this fully updated volume offers a comprehensive overview of today’s hacking and computer security landscape. You will learn the latest techniques to uncover, legally disclose, and fix vulnerabilities deep within software and networks. The book includes six brand-new chapters and fully updated material throughout. Gray Hat Hacking, Second Edition is the only ethical hacking book on the market to provide in-depth coverage of vulnerability discovery and reverse engineering. It also offers full details on cutting-edge attack methods, hacking-related law, malware analysis, and post-exploitation survival. Author Robert J. Glushko and Tim McGrath. Much of the business transacted on the Web today takes place through information exchanges made possible by using documents as interfaces. For example, what seems to be a simple purchase from an online bookstore actually involves at least three different business collaborations—between the customer and the online catalog to select a book; between the bookstore and a credit card authorization service to verify and charge the customer’s account; and between the bookstore and the delivery service with instructions for picking up and delivering the book to the customer. Document engineering is needed to analyze, design, and implement these Internet information exchanges. This book is an introduction to the emerging field of document engineering. The authors, both leaders in the development of document engineering and other e-commerce initiatives, analyze document exchanges from a variety of perspectives. Taking a qualitative view, they look at patterns of document exchanges as components of business models; looking at documents in more detail, they describe techniques for analyzing individual transaction patterns and the role they play in the overall business process. They describe techniques for analyzing, designing, and encoding document models, including XML, and discuss the techniques and architectures that make XML a unifying technology for the next generation of e-business applications. Finally, they go beyond document models to consider management and strategic issues—the business model, or the vision, that the information exchanged in these documents serves. Author edited by Guido Dornhege … [et al.] foreword by Terrence J. Sejnowski. Interest in developing an effective communication interface connecting the human brain and a computer has grown rapidly over the past decade. The brain-computer interface (BCI) would allow humans to operate computers, wheelchairs, prostheses, and other devices, using brain signals only. BCI research may someday provide a communication channel for patients with severe physical disabilities but intact cognitive functions, a working tool in computational neuroscience that contributes to a better understanding of the brain, and a novel independent interface for human-machine communication that offers new options for monitoring and control. This volume presents a timely overview of the latest BCI research, with contributions from many of the important research groups in the field. The book covers a broad range of topics, describing work on both noninvasive (that is, without the implantation of electrodes) and invasive approaches. Other chapters discuss relevant techniques from machine learning and signal processing, existing software for BCI, and possible applications of BCI research in the real world. A semantic Web primer, 2nd ed. Author Grigoris Antoniou and Frank van Harmelen. The development of the Semantic Web, with machine-readable content, has the potential to revolutionize the World Wide Web and its uses. A Semantic Web Primer provides an introduction and guide to this still emerging field, describing its key ideas, languages, and technologies. Suitable for use as a textbook or for self-study by professionals, it concentrates on undergraduate-level fundamental concepts and techniques that will enable readers to proceed with building applications on their own and includes exercises, project descriptions, and annotated references to relevant online materials. A Semantic Web Primer provides a systematic treatment of the different languages (XML, RDF, OWL, and rules) and technologies (explicit metadata, ontologies, and logic and inference) that are central to Semantic Web development as well as such crucial related topics as ontology engineering and application scenarios. This substantially revised and updated second edition reflects recent developments in the field, covering new application areas and tools. The new material includes a discussion of such topics as SPARQL as the RDF query language; OWL DLP and its interesting practical and theoretical properties; the SWRL language (in the chapter on rules); OWL-S (on which the discussion of Web services is now based). The new final chapter considers the state of the art of the field today, captures ongoing discussions, and outlines the most challenging issues facing the Semantic Web in the future. Supplementary materials, including slides, online versions of many of the code fragments in the book, and links to further reading, can be found at www.semanticwebprimer.org. Developing software for Symbian OS : a beginner’s guide to creating Symbian OS v9 smartphone applications in C++, 2nd ed. Author Steve Babin reviewed by Antony Pranata … [et al.]. “Many problems encountered by engineers developing code for specialized Symbian subsystems boil down to a lack of understanding of the core Symbian programming concepts. Developing Software for Symbian OS remedies this problem as it provides a comprehensive coverage of all the key concepts. Numerous examples and descriptions are also included, which focus on the concepts the author has seen developers struggle with the most. The book covers development ranging from low-level system programming to end user GUI applications. It also covers the development and packaging tools, as well as providing some detailed reference and examples for key APIs. The new edition includes a completely new chapter on platform security. The overall goal of the book is to provide introductory coverage of Symbian OS v9 and help developers with little or no knowledge of Symbian OS to develop as quickly as possible. There are few people with long Symbian development experience compared to demand, due to the rapid growth of Symbian in recent years, and developing software for new generation wireless devices requires knowledge and experience of OS concepts. This book will use many comparisons between Symbian OS and other OSes to help in that transition. Get yourself ahead with the perfect introduction to developing software for Symbian OS. Human factors and voice interactive systems, 2nd ed. Author Daryle Gardner-Bonneau, Harry E. Blanchard [editors]. Human Factors and Voice Interactive Systems, Second Edition provides in-depth information on current topics of major interest to speech application developers, and updates material from chapters that appeared in the previous edition. The first nine chapters of the book cover issues related to interactive voice response systems, including both mobile and multimodal device user interfaces as well as classic automated telephone systems. The remaining chapters cover special topics including synthetic speech and the design of speech applications to enhance accessibility to people with disabilities and the ever-growing population of older adults. Human Factors and Voice Interactive Systems, Second Edition is a collection of applied research and scholarly synthesis contributions by seasoned professionals in the field that highlight continuing efforts to study human interaction with speech technologies. In light of the official Christmas Lighting of the UP Campus, the library will be closing early today, at 5 p.m., to enable the library staff to attend the said event. You may check out reserved books starting 12 noon. Thank you very much!